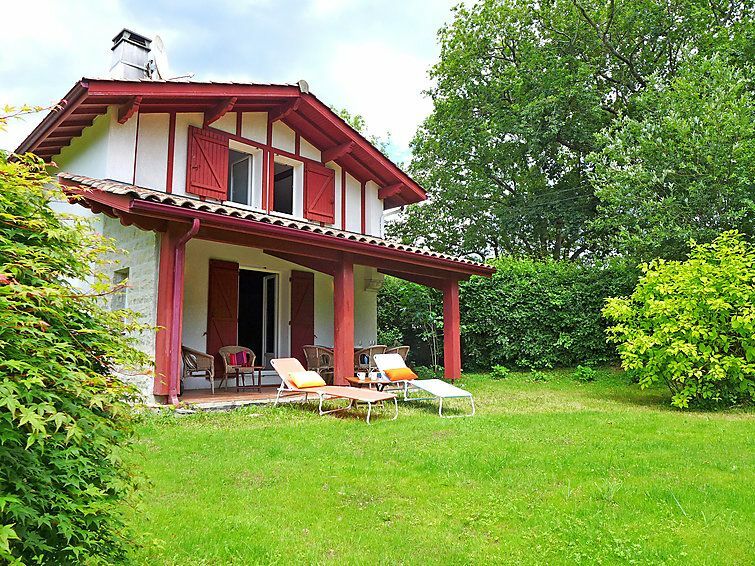 St Pée sur Nivelle 15 km from Saint Jean de Luz: Single-family house "this property". 15 km from the sea, 5 km from the lake, 15 km from the beach. Private: property 2'300 m2 (fenced), parking (for 3 cars). Grocery 1.5 km, supermarket 2 km, restaurant 1.5 km, bakery 1.5 km, sandy beach "Saint Jean de Luz" 15 km, outdoor swimming pool 11 km, thermal baths "Cambo les Bains" 16 km, bathing lake 5 km. Golf course 11 km, tennis 11 km, riding stable 11 km. Hiking paths: La Rhune 12 km, Espagne 13 km. The keys‘ handover takes place by the agency Interhome in Saint Jean de Luz, 13 km. 5-room house 115 m2. Practical and beautiful furnishings: living/dining room with TV (flat screen), radio, DVD and wood-burning stove. Exit to the garden, to the terrace. 1 room with 1 bed (120 cm). Kitchen (oven, dishwasher, 4 induction hot plates, microwave, freezer, electric coffee machine). Shower, sep. WC. Upper floor: 1 room with 2 beds (80 cm). 1 room with 2 beds (90 cm). 1 room with 1 bed (120 cm). Bath/WC. Electric heating. Terrace 21 m2, south facing position, garden. Terrace furniture, barbecue. Facilities: washing machine, dryer, iron, baby cot, hair dryer. Internet (WiFi, free). Please note: 1 pet/ dog allowed. Smoke alarm.